*£6,235 OTR, price of £4,999 is after the government’s OLEV grant is applied. Vespa Elettrica is the most modern icon of Italian technology, it is synonymous with advanced connectivity and quiet operation, customisation and accessibility, respect for the environment and unique style. These are values that have always belonged to Vespa and which now, in Vespa Elettrica, have been fully accomplished, confirming Vespa as the brand that has always been ahead of its times with respect to its market. The heart of Vespa Elettrica is a Power Unit capable of delivering continuous power of 3.5 kW and peak power of 4 kW: values that, combined with a torque of over 200 Nm, provide performance superior to that of a traditional 50cc scooter, especially in terms of acceleration and uphill power that benefits from the typical quick output of electric motors. This results in an agile and enjoyable ride on urban routes in total silence. 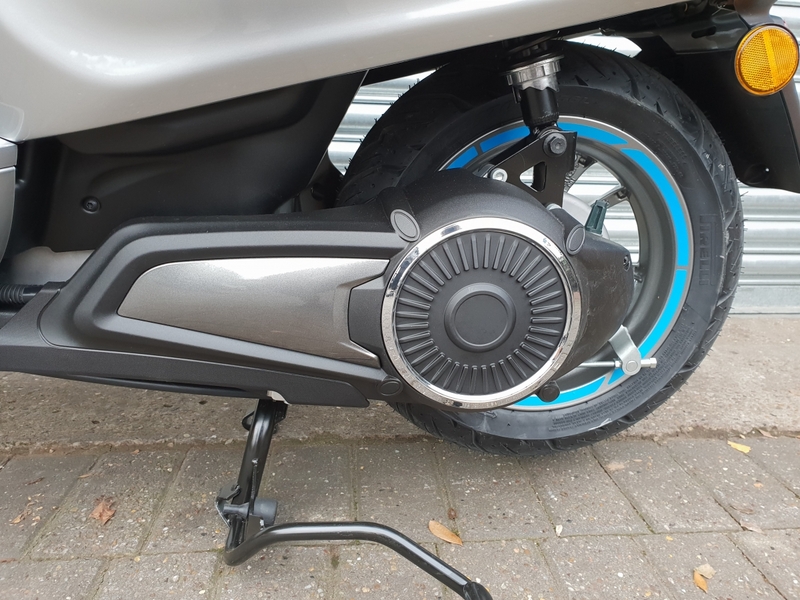 In fact, Vespa Elettrica is completely silent, helping to make cities less chaotic and more liveable, countering pollution even in terms of noise. 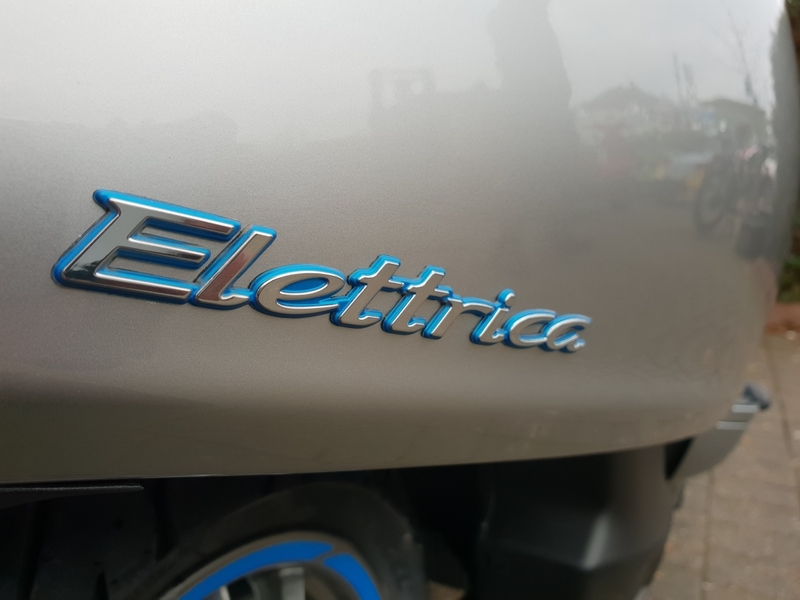 Vespa Elettrica offers a range of up to 100km, a value that does not change significantly on a rural route, thanks to a modern lithium-ion battery and an efficient Kinetic Energy Recovery System (KERS), which charges it in the deceleration phases. Charging operations are the simplest thing imaginable: the lithium-ion battery, just like the one in modern smartphones, needs no special precautions. To charge, simply extract the cable from the seat compartment, where the fuel cap is usually located, and plug in to a normal wall outlet or one of the growing number of public charging stations in big cities. The standard time required for a full charge is 4 hours (with voltage of 220V). 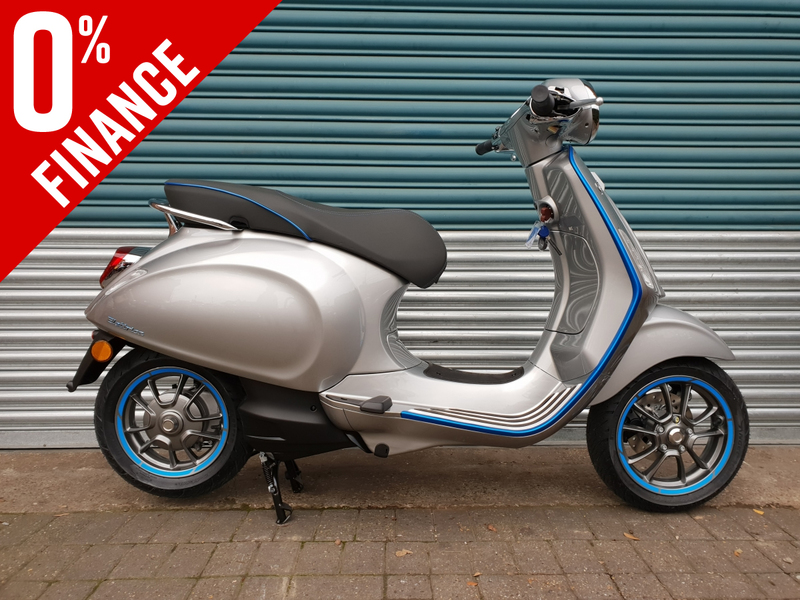 As further confirmation of how extremely easy user-friendly Vespa Elettrica is, the motor and battery pack are completely maintenance-free. The battery provides excellent efficiency for up to 1000 full charging cycles. 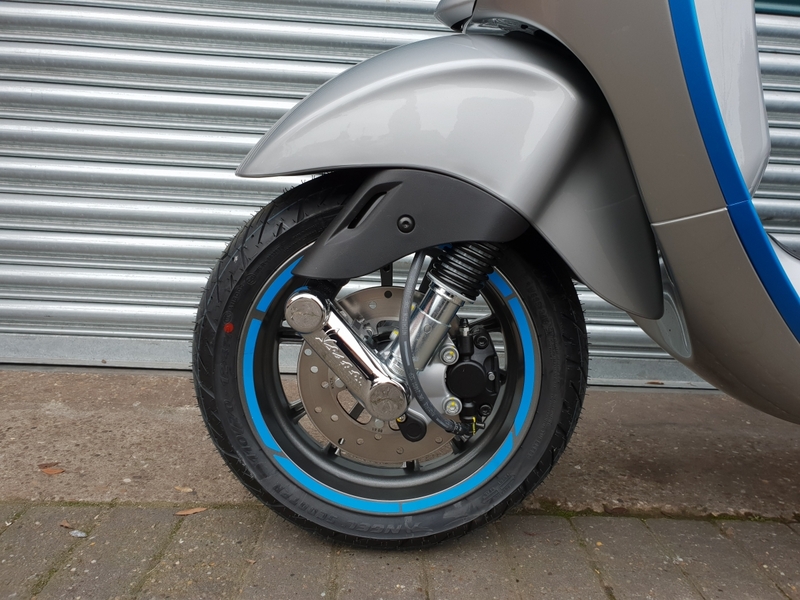 This translates into a range of between 50,000 and 70,000 km, equivalent to approximately 10 years of operation for a vehicle intended for urban commuting. Even after the thousand charging cycles, the battery still maintains 80% of its capacity and is perfectly usable. 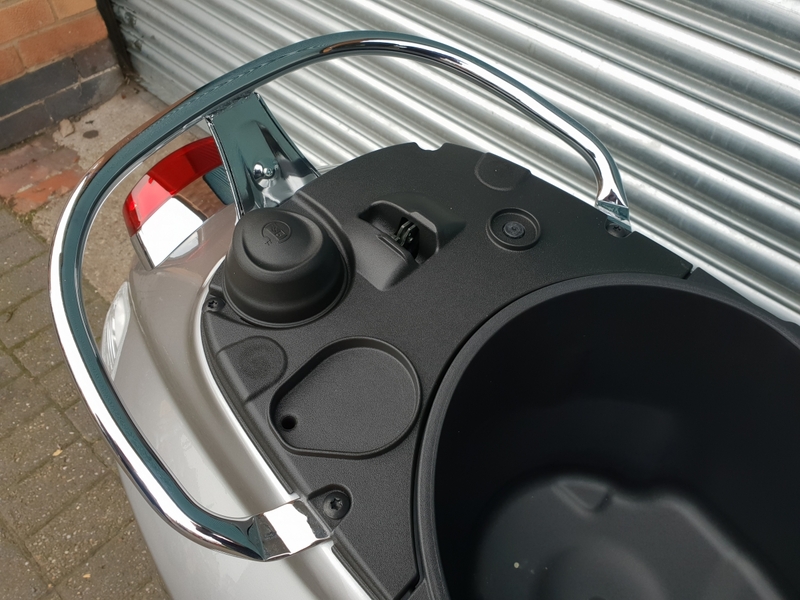 Located under the helmet compartment, the compact battery pack does not compromise the functionality of the Vespa Elettrica seat compartment, which can hold a Jet helmet. The Ride by Wire electronic accelerator controls the power output of Vespa Elettrica’s motor. 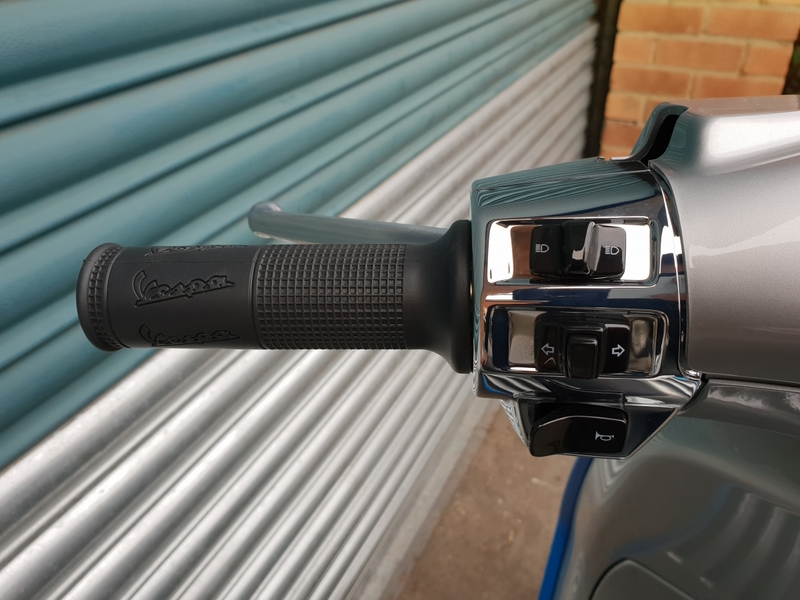 By pressing the RIDING MODE button on the right hand side of the handlebar, the rider can choose between ECO and Power, in addition to Reverse mode for easier handling of Vespa Elettrica while manoeuvring. ECO mode, intended to save energy, extends battery life; speed is limited to 30 km/h and acceleration is more gradual. However, Power is the basic riding mode which fully exploits the power of the motor. Vespa Elettrica is not just a silent, ecological and technologically advanced vehicle; It is also, and above all, connected! 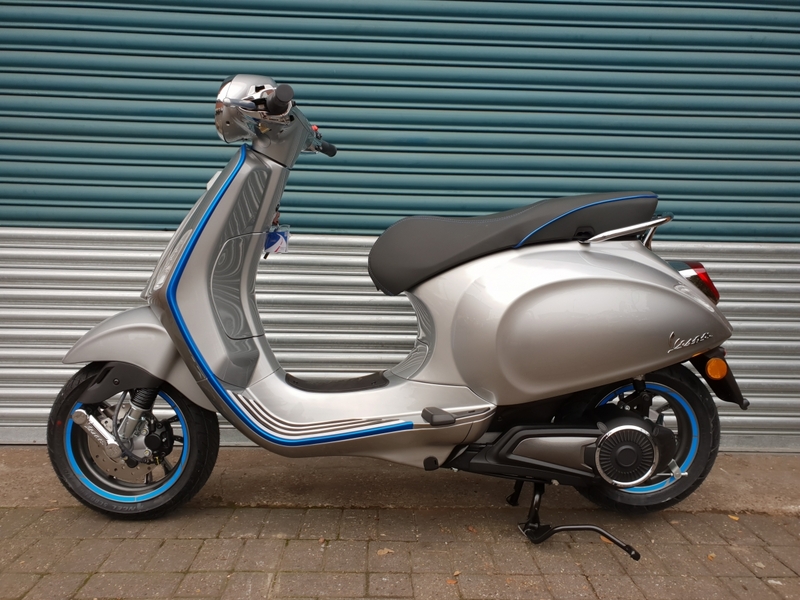 The many features offered by a new version of the Vespa Multimedia Platform. 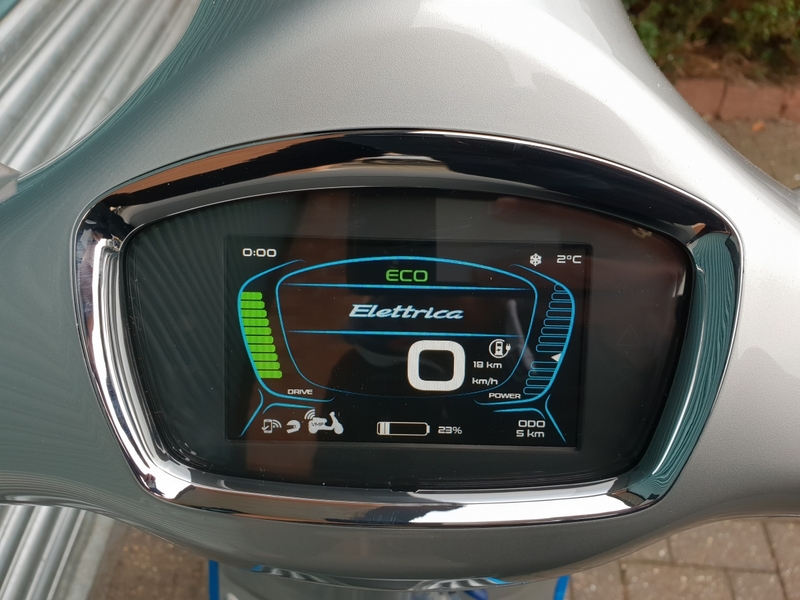 The multimedia system that connects a smartphone to the Vespa Elettrica can be managed through the 4.3″ TFT colour digital instrument, which is always easy to read thanks to the twilight sensor that adapts the background and colour of the characters to the light conditions (day/night mode) and the four adjustable brightness levels. The extensive information displayed is arranged in a very impressive and extremely rational graphic diagram. 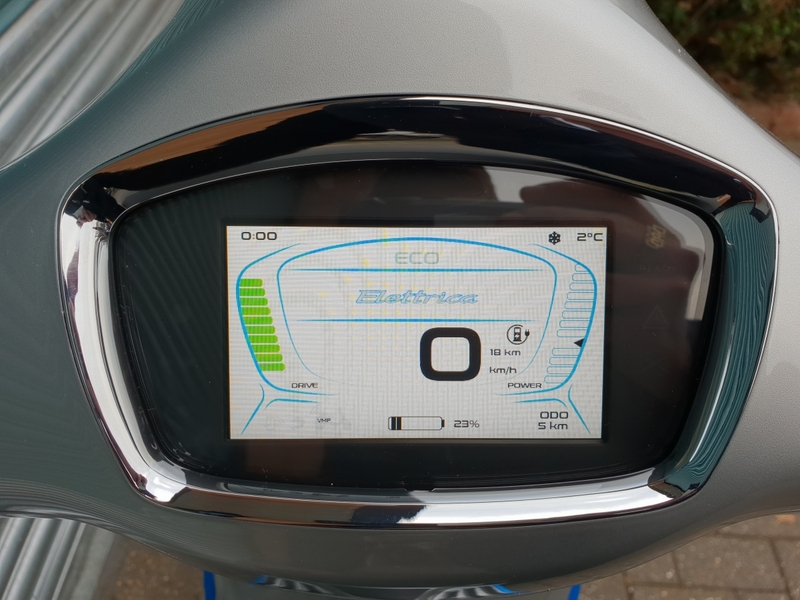 The centre of the screen always contains the main information such as speed, selected riding modes, residual range and battery charge level (%), while the ecological riding quality and the level of energy used or recovered during the ride are indicated on either side. 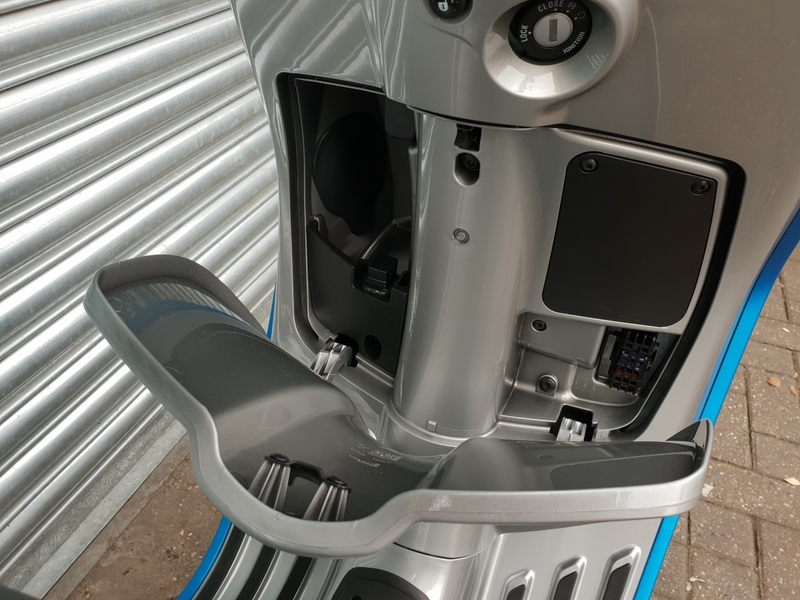 When using the dedicated Vespa App on your smartphone and connecting it to the vehicle via Bluetooth, this allows you take full advantage of the capabilities of the TFT display on which all notifications of incoming calls and messages appear, highly visible in the centre. 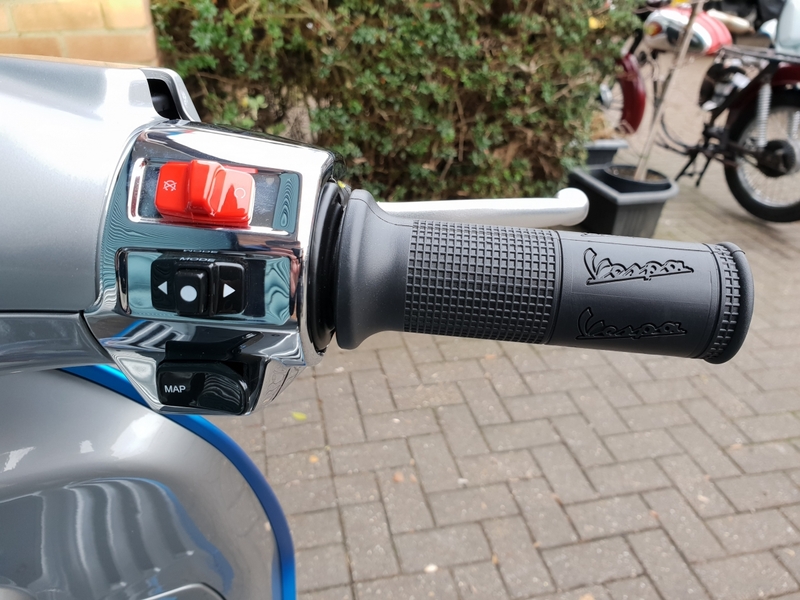 The system also allows you to use the handlebar controls to answer calls and to use the smartphone’s voice commands to make calls or play music from your own playlist. 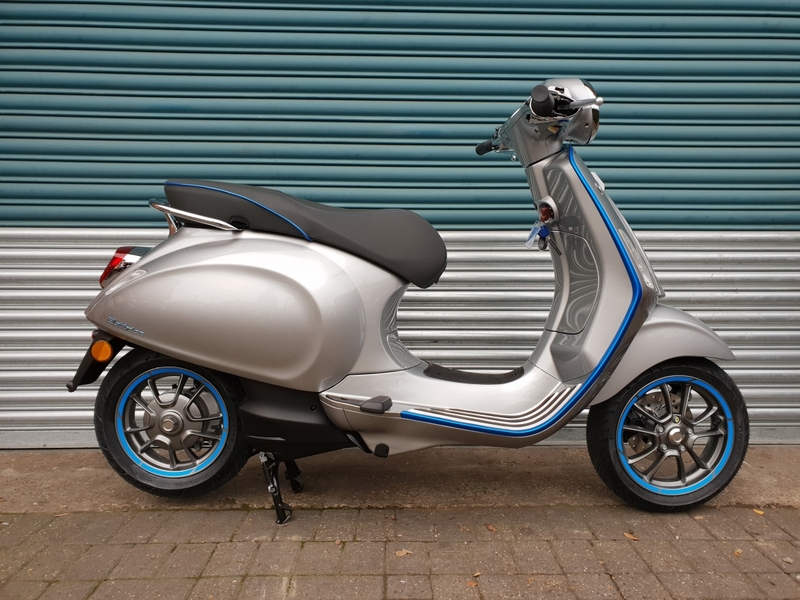 As with every Vespa, Vespa Elettrica can also be customised and made into a unique piece, following the personality of the rider, thanks to a rich range of accessories. 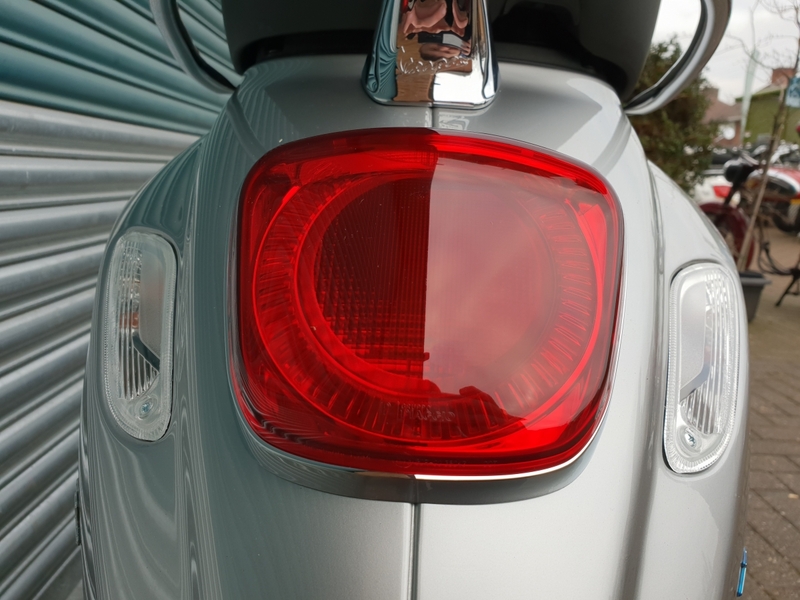 The dedicated top box, painted entirely in the same colour as the vehicle and enhanced by the chromed Vespa badge, can hold a full-face helmet. 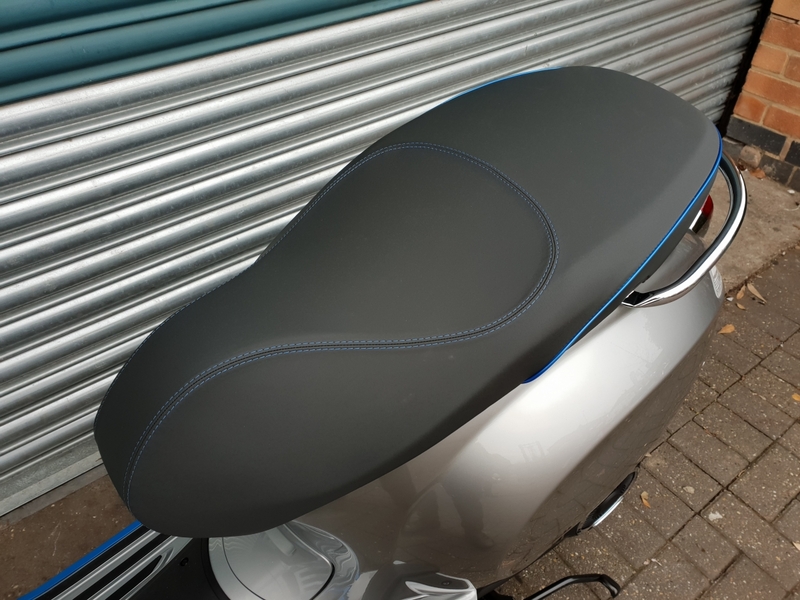 The top box can be finished with a backrest, covered in the same material as the seat. The chromium-plated base where the top box is mounted can also be used as a luggage rack. 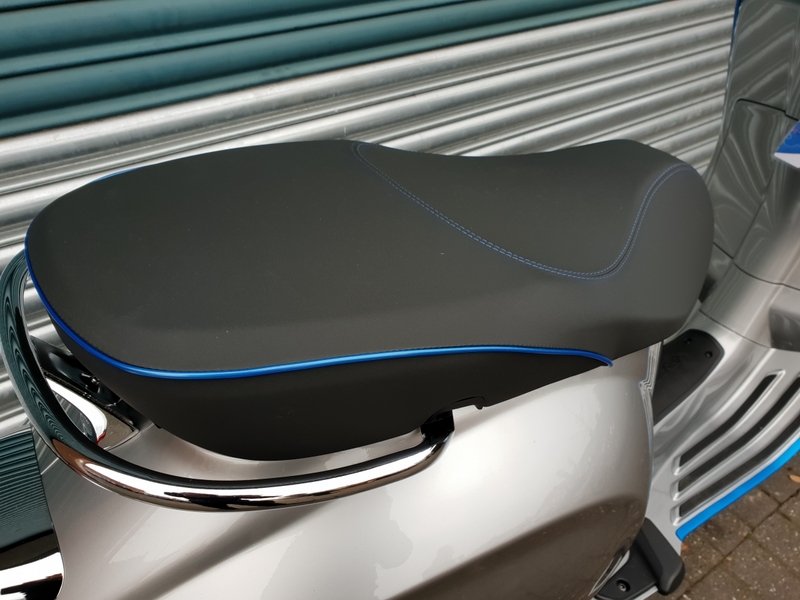 An extra touch of elegance is provided by the genuine Italian leather seat and backrest that are subjected to a special protective treatment in order to maintain a high level of quality over time. The range of Vespa Elettrica accessories is also enriched by the convenient side-stand – in black-painted steel to make parking easier, an outdoor cover and an indoor “big logo” cover, both with convenient openings to accommodate any accessories, and a non-slip rubber mat. 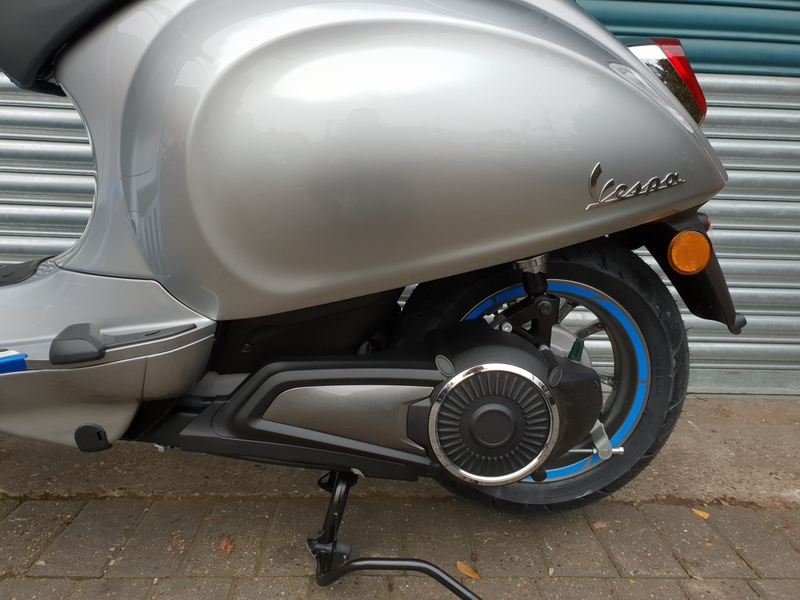 An electronic alarm is available for Vespa Elettrica as is a mechanical saddle-handlebar lock and a line of customised mechanical anti-theft devices. The essential handlebar muffs and leg covers are practical and fast to fit, made of thermal material to provide excellent protection from the weather. 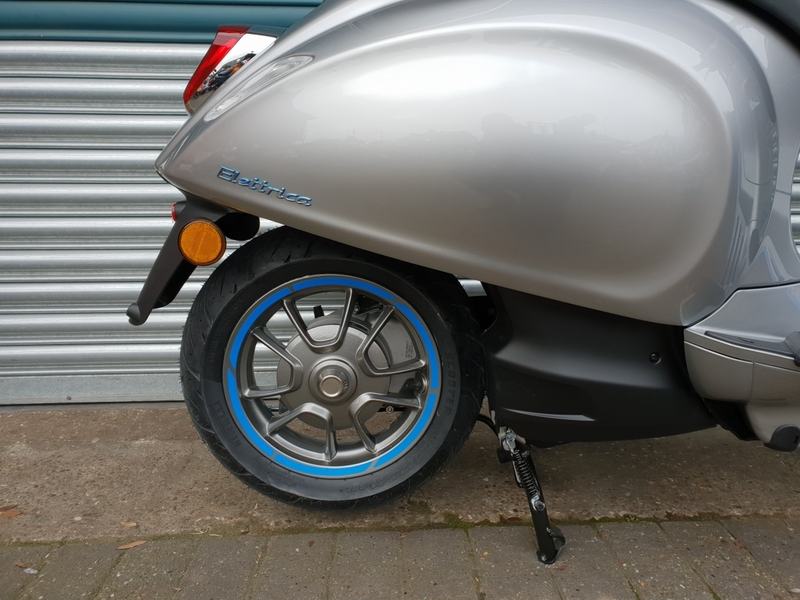 The Vespa Elettrica leg cover bears a metal Vespa logo and provides maximum stability even at high speeds. 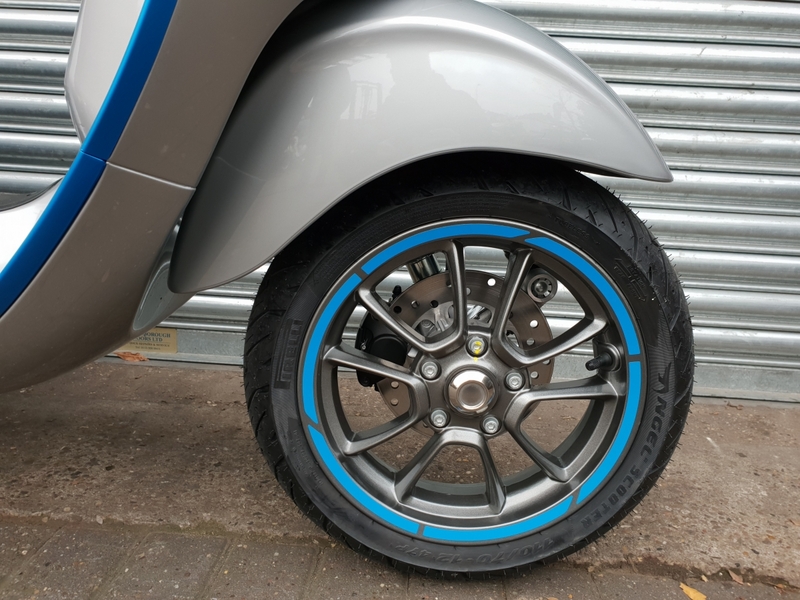 Got a question about this Vespa Elettrica?